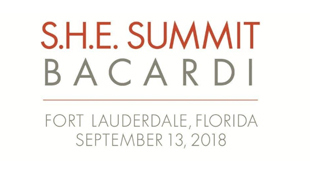 Coral Gables, Fla., July 26, 2018 – The 3rd Annual S.H.E Summit Bacardi will convene thought-provoking speakers and hundreds of women (and men) to unleash the potential of current and future female leaders while lifting others. In collaboration with S.H.E. Summit, a globally-celebrated women’s leadership conference, S.H.E. Summit Bacardi is an empowerment event aimed at celebrating and cultivating female and male leaders from Bacardi, partner corporations, and other businesses. Due to the success of the first two conferences and growing interest among the greater South Florida community, the annual event will take place in a larger and more central location on September 13 at the Marriott Harbor Beach Resort & Spa in Fort Lauderdale. S.H.E. stands for “She and He Helps Empower” and was created by women’s empowerment educator and accelerator, Claudia Chan. Aimed at connecting, educating, and activating rising and top talent in South Florida, the S.H.E. Summit Bacardi will feature a prestigious list of dynamic speakers with incredible personal and professional stories including Claudia Chan, S.H.E. Summit CEO and author of This Is How We Rise; K.C. Kavanagh, Chief Communications Officer for Bacardi; Shannon Allen, founder and owner of Grown; Heather Monahan, Boss in Heelsauthor and overall badass; Wesley Cullen, general manager of Casa Bacardi Visitor Center in Puerto Rico; Kristy Wallace, CEO of Ellevate Network; Kathy Caprino, international career executive and leadership coach dedicated to the advancement of women in business; Paula Glickenhaus, global head of Bacardi’s Women in Leadership program; and Lauren Brody, author of The Fifth Trimester: The Working Mom’s Guide to Style, Sanity, andSuccess After Baby, plus many more. Informative workshops, thought-provoking panel discussions, and keynotes will cover everything from gender inequality, barriers to leadership ascendance and financial empowerment, to wellness, raising children who value equality and synergizing the sexes to create a path to success. Join more than 700 professionals representing Bacardi, partner corporations, and firms across various industries including spirits, marketing, hospitality, luxury, law, consulting, and more. The event will conclude with a networking cocktail reception sponsored by Bacardi. Attendees who purchase a VIP ticket will have access to a private keynote address luncheon and receive a unique gift bag. Current sponsors include Southern Glazer’s Wine & Spirits, Epsilon,MetrixLab, BBDO, Hogan Lovells, and Team Enterprises. Founded more than 156 years ago, in Santiago de Cuba on February 4, 1862, family-owned Bacardi currently employs approximately 5,500, operates more than 20 production facilities, including bottling, distilling and manufacturing sites, and sells its brands in more than 170 countries. Bacardi Limited refers to the Bacardi group of companies, including Bacardi International Limited. Visit http://www.bacardilimited.com or follow @BacardiLimited. S.H.E. Summit is the renowned global leadership conference that takes place once-a-year to celebrate and accelerate the global advancement of women and gender equality. Founded by women’s leadership expert Claudia Chan and named one of Inc.’s “10 most innovative conferences,” S.H.E. Summit convenes 50+ thought leaders and movement drivers of today’s most relevant women and societal issues on its global stage to inspire thousands of influencers to lead change in the world. Offering a transformational experience of connection, education, and activation, S.H.E. Summit ignites women and men to RISE to their highest potential and lift others in the process with the mission of achieving gender equality by 2030. S.H.E. Summit is a business unit of S.H.E. GLOBAL MEDIA, a women’s empowerment company founded by Claudia Chan.